Nope, there’s no Super Mario Galaxy 3, Super Mario 3D World 2 or even a second New Super Mario Bros. for Wii U this year. Instead we get something that is totally unique: Super Mario Maker. 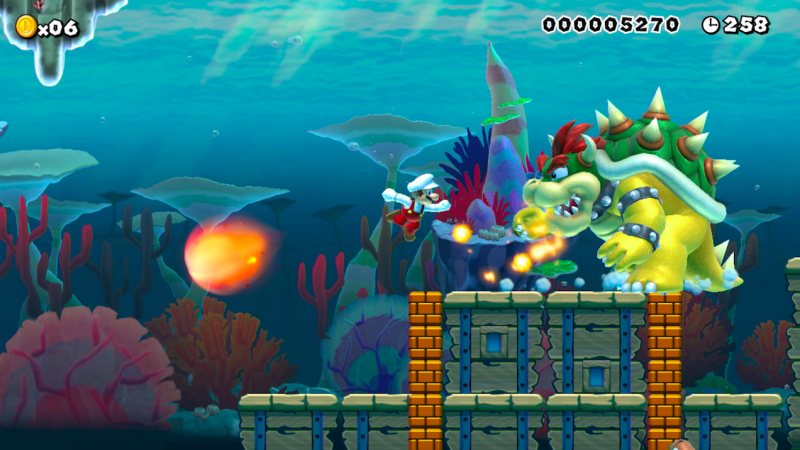 Super Mario Maker could perhaps be the last 2D Super Mario game we ever get. That is because the game is a kit to make your own 2D Mario stages and upload them online for everyone to play. With thousands or even millions of stages to play and counting, it’s literally a lifetime of stages within one package. The reason there will be millions and millions of stages is because Nintendo made the simplest, fun and accessible tool that can get a stage made and uploaded in a few minutes. 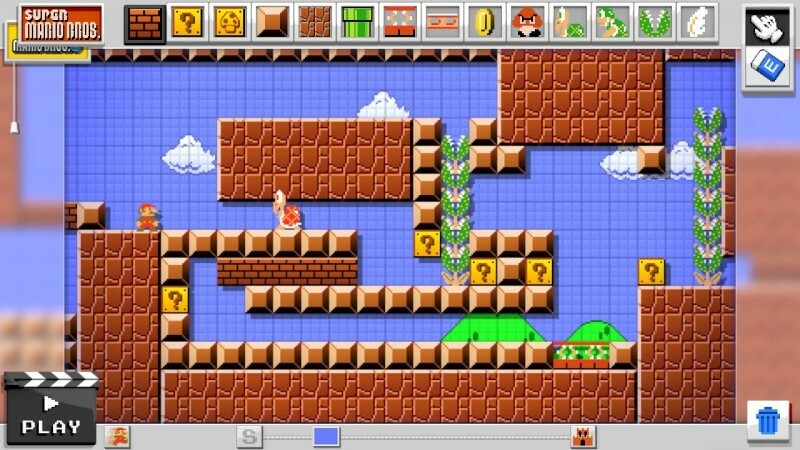 The stages that you create in Super Mario Maker are based off of four games: Super Mario Bros., Super Mario Bros. 3, Super Mario World and New Super Mario Bros. U; and the most amazing thing about it is that a quick tap can change up the layout instantly, either game (like SMB to SMW) or environment (underground to castle). It’s shocking that these retro games look better since the stages you play and make are in 1080p, 60FPS and 16x9 widescreen. The game has it’s usual tropes to create with: Goombas, Koopa Troopas, Boos, pipes, bricks, coin blocks, etc. You can also drop in Bowser, Magikoopas and Bowser Jr.; all who had new forms to compensate for their absence in other games (Bowser’s SMW version is new since he never left the Koopa Clown Car in the real game). Each of the four games has the enemy/Mario gameplay and AI that the original game had, no alternation or programming needed. For example, Mario can’t pick up Koopa shells in the original SMB, he can wall jump in NSMB, and Bowser has a different fighting pattern in each version. The GamePad stars in Super Mario Maker because its touchscreen allows an extremely easy click and drag interface. Want a Bowser? Drag it to where you want it. Want Bowser Jr.? Just shake Bowser while you’re dragging and boom: Bowser Jr. Want that Bowser bigger? Drag a mushroom on it, and now he’s huge. Want him to fly? Slap some wings on him. Want to surprise your players? Pop that giant flying Bowser in a coin block and troll them all! The genius of the game is that every block, enemy and most of the platforms have this seamless customization. 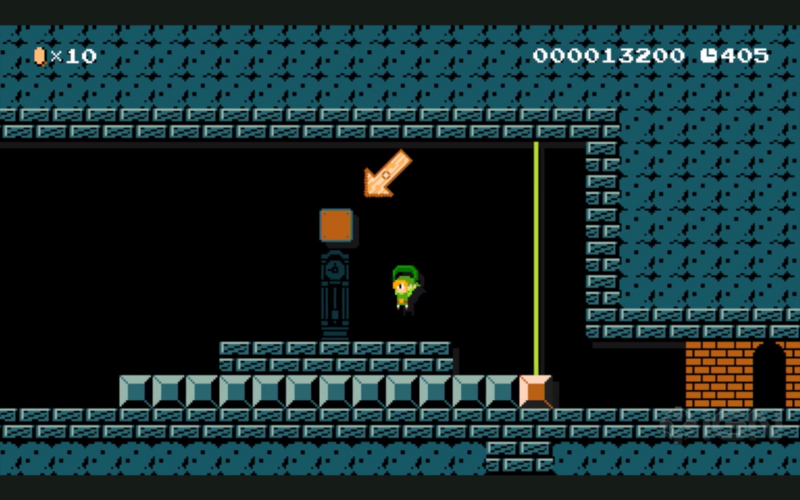 You can even add silly things like sound and visual effects, or have doors and pipes lead to non-linear pathways. The only downside is that you don’t get everything on the get-go, and you must keep playing to continuously unlock content. The original SMB however doesn’t have a new secondary power-up like SMB3, SMW and NSMB’s Raccoon Leaf, the Cape Feather or the Propeller Suit respectfully, so they made the Mystery Mushroom. This new question-branded mushroom changes Mario into random costumes that are unlocked or scanned through with amiibo figures. It supports all the Super Smash Bros., Splatoon and Mario figures, as well as the upcoming Animal Crossing ones. They aren’t required since they can be unlocked, but having the figures helps quicken the process and allows you to unlock the ones who don’t have figures. These costumes are the coolest reason to use the SMB skin, since they made most the costumes have cool sound effects, death music and victory music. Because of the ease of making stages and the lack of a totally different version, several SMB3, SMW and NSMB enemies and elements are totally absent. Thwimps, the Tanooki Suit, Mechakoopas, the Koopalings, the Flying Squirrel Suit, Keys/Keyholes, Spike, or the awesome Hammer Bros. Suit and more are all AWOL. 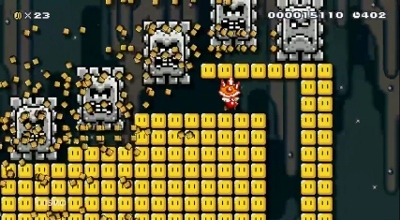 These omissions were some of the more disappointing parts of Super Mario Maker since I would have taken advantage of these SMB3 and SMW objects and what they uniquely did. Also because of SMB’s limitations, you can’t create hills and ramped platforms or some of the newer stuff like the circular platforms of NSMB. One thing that was in all four Mario games that are omitted from Super Mario Maker were checkpoints, and boy is it annoying not having them. In the real games, harder levels saved you some time by starting you at a checkpoint, and with the crazy long deathtraps people are making in this game, having to start from the beginning is frustrating. Speaking of which, the biggest issue I’m coming from the game is that the community’s expert stages are mainly cheaply difficult stages for the sake of being difficult. I’ve enjoyed the other difficulties with their creative ideas, though they are a bit easy, but most of the expert stages are just a ton of junk flooding the stage and the user either squeaked by or had something hidden to help them. The few good ones are absolutely amazing, but you have to endure to finally get to a good one. That issue is what is smothering the 100-Mario Challenge, where you have 100 lives to beat 16 stages. Though I can skip as many as I like, I feel like I’m filtering more than playing. You can play specific levels if you like, all you need is the generated code for the stage, and you can download it if you want to keep it. If you like a particular stage or stages from a particular user, you can follow him or her. You can’t manually search stages, filter or see stages from your Wii U friends list, which is a bummer. Stages you upload will update you on feedback: either with plays amounts, complete ratio, Miiverse posts and stars (likes). The presentation of Super Mario Maker is awesome though, especially if you played the mouse-controlled Mario Paint way back on the Super NES. A form of the gnat-swatting minigame is back, the load screens as well as and the music for uploading and saving stages are assets directly ripped from Mario Paint. In addition, Nintendo has a ton of simple remixes throughout the game, and creating stages warps the music around when you’re making platforms is such a cool effect. Even the digital manual is amazing; it’s interactive, has a ton of good tips (as well as a particular love of cats and life advice) and stars a helper named Mary O. Despite the games looking better than ever, they only thing that looks off are the NSMB enemies because they have a lower framerate than the rest of the game. If Super Mario Maker launched with the Wii U, I think the system would have done so much better throughout its lifecycle because this is honestly Nintendo’s first “real” Wii U game. It takes advantage of the system’s strengths like the GamePad, the Nintendo Network and the console’s horsepower. It’s ease of use trumps it over other user-created games like LittleBigPlanet because of the simple, grid-based layout that Super Mario Bros. uses plus the touch screen. It’s missing things to make it magnificent, but as is, it’s pretty good.